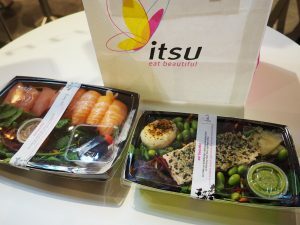 Itsu are one of those pseudo-Asian chain outlets aimed at wealthy health-conscious City workers i.e. hangry overpriced food. I’ve had it a few times before from the Kings Cross outlet. They also make instant cup noodles sold at supermarkets. The glass vermicelli one I tried was pretty okay . I happened to pass by in the evening of the opening day of Itsu’s Bristol outlet. Half an hour before closing, all sushi and salads are half-price! In spite of what the website claims (half-price sale starts at 6.30 pm), it actually starts at 8.30 pm. I wasn’t aware of that and nearly paid full-price for a beef box. I nipped out to Mission Burrito to while away the time and have my dinner only to return at 8.50 pm. I snagged a tuna and salmon sashimi, and a steamed salmon with poached egg. For the grand total of only £ 5.74! When I left it was already 9 pm – closing time. There was still lots of smoked salmon and sashimi left. I wonder whether it’s given away to the homeless people of Bristol (poor them having to stomach raw fish or go hungry!). can i get the information ?